Great Britain finished with two gold medals at the European flat-water Championships after victories for Tim Brabants and Lucy Wainwright in Milan. Wainwright finished ahead of Ukraine's Inna Osypenko-Radomska to win the women's K1 200m kayak final. Brabants, 31, reclaimed his K1 (kayak single) 1000m title on Saturday after holding off Hungary's Gabor Kucsera in the last 100m to repeat his 2006 win. Rachel Cawthorn and Hayleigh Mason were fourth in the women's K2 200m final. Brabants, who won a bronze medal in the 1,000m at the 2000 Sydney Olympics, had already earned his Beijing Olympic spot at an April meeting. 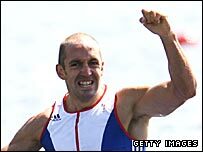 His performances at last year's world championships secured the Great Britain team's places in the men's K1 500m and 1000m events in Beijing. The British team believe Wainwright, James Train (C1 1000m), and the pairing of Jess Walker and Anna Hemmings (K2 500m) have also qualified for Beijing following the weekend's finals. But they must wait for confirmation from the International Canoe Federation owing to the complexities of qualification in the sport.